I’ve been fascinated by space since studying the solar system in second grade. If there’s an astronaut book out there, I’ve read it. 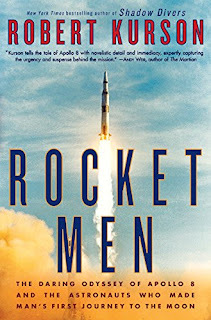 The latest is Rocket Men: The Daring Odyssey of Apollo 8 and the Astronauts Who Made Man’s First Journey to the Moon, by Robert Kurson. The Saturn 5 moon rocket had flown twice, and the second time was a failure. The lunar module was behind schedule. The Soviets were suspected of attempting a manned lunar flight by December. The American space program was in trouble. A crew had perished in a spacecraft fire on the pad in 1967. And not only the space program, but all of America was convulsing with anti-war fervor, racial unrest, and assassinations in 1968. Apollo 7, the first manned flight of the Apollo spacecraft, had yet to fly when George Low proposed a lunar flight in December, four scant months away. Precise navigation and trajectories had to be calculated, the moon rocket fixed, essential systems and software developed. 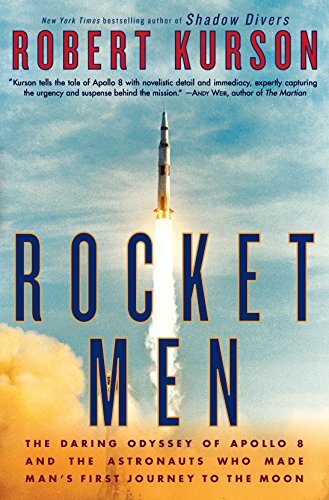 It was dangerous, but it would keep the space program moving forward toward the goal of landing men on the moon before the end of the decade, and maybe even beat the Soviets. The optimal launch window would be December 20 or 21, which meant Apollo 8 would be orbiting the moon on Christmas. If the flight was a disaster, Christmas would be forever linked with it. The crew selected for the daring flight had been training for Apollo 9. Frank Borman had little interest in space exploration. He joined NASA to fight the Soviet Union on the new battlefield of space. His teachers had labeled him as bossy and hardheaded. His peers found him arrogant. His own assessment was, he was among the best of the astronaut corps. His opposite had been his crewmate on Gemini 7. Jim Lovell had a lifelong dream of exploring space and flying rockets. Folks most remembered his warmth and friendliness. Rookie Bill Anders rounded out the crew. He was dismayed by their assignment to Apollo 8. He’d been training to be a lunar module pilot. With no LM, he’d be switched to command module pilot, and his future chances of walking on the moon disappeared. The flight of Apollo 8 was a resounding success. And 1968 ended on a bright, shining note. Leave Them? Or Bring Them Home?